Windows System Assessment Tool (WINSAT), is a free benchmarking tool that measures various performance characteristics and capabilities of a computer running in Windows Vista and Windows Server 2008. 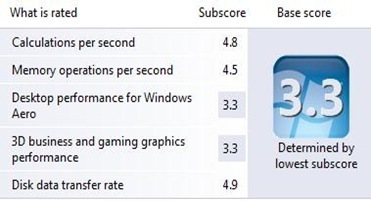 The ratings are displayed as Windows Experience Index or WEI score. How to get the WEI score of a Network Computer running in Windows Vista? Use Vbscript to access the new WMI class, Win32_WinSAT, that can retrieve system assessment information from ANY Windows Vista computer. Sadly, for Windows Vista only. If you don't understand the above explanation, don't mind about it, just follow the steps below. 1. Open the notepad and paste the code below. 2. When saving the script, In the "Save as type", Select "ALL Files (*. *)" and input any name with ".vbs" extension. File menu->Save As->Select ALL Files->type "GetWinSAT.vbs"
If you enter a wrong computer name, it will display an error.